A big snow storm dumped twenty inches of snow in Manhattan. 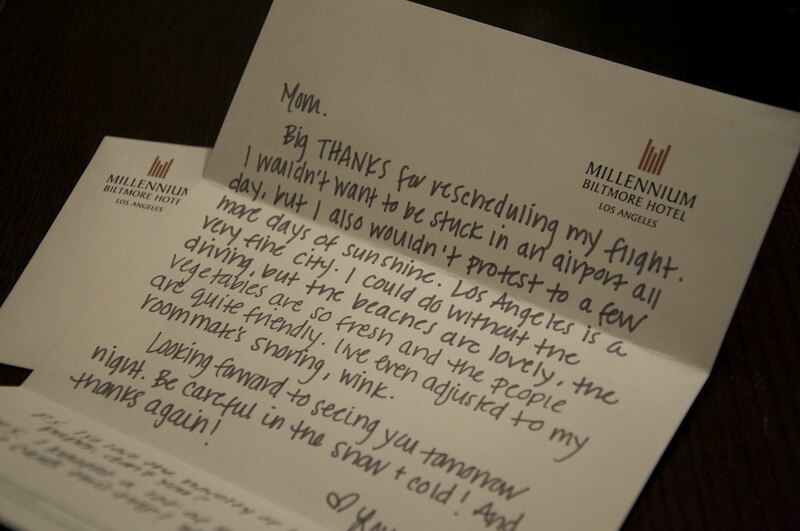 My Mom, a former flight attendant, sprung into action and switched my flight. Three cheers! Big THANKS for rescheduling my flight. I wouldn’t want to be stuck in an airport all-day, but I also wouldn’t protest to a few more days of sunshine. Los Angeles is a very fine city. I could do without the driving, but the beaches are lovely, the vegetables are so fresh and the people are quite friendly. I’ve even adjusted to my roommate’s snoring, wink. Looking forward to seeing you tomorrow night! Be careful in the cold! And thanks again. P.S. I so love the novelty of hotel writing paper. P.P.S. I bought a lot (a way lot) of pretty stationery + cards this trip.